The Vibration Institute (VI), established in 1972, provides training and certification for individuals who study and diagnose machinery dynamics and vibration. They offer programs including education, training, certification, and opportunities for exchanging technical knowledge. 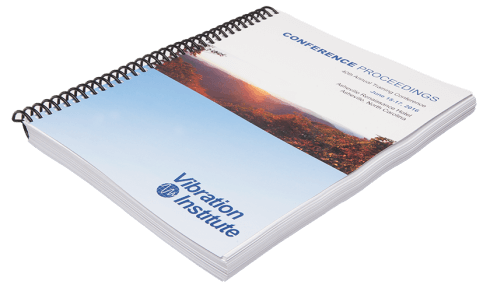 The Vibration Institute (VI) offers seven different face-to-face, instructor-led courses in locations around the world, with many courses requiring between two and four books. Prior to working with Omnipress, VI printed and shipped all course materials themselves, using in-house equipment and staff. Over time, print quality was an increasing concern. VI is a leader in their industry, but their materials no longer reflected this. Additionally, at least one team member spent 30-40% of her time printing books and packing boxes — time that would be better spent on program growth and development. Recognizing the need to make a change, VI began discussing potential options with Omnipress, including outsourcing not only their print and fulfillment operation, but rebranding and design services as well. Omnipress was able to provide a cost comparison analysis that demonstrated outsourcing the print and fulfillment of their course materials would actually provide cost savings for VI. Additionally, Omnipress provided a re-designed and printed sample of VI’s course materials that would ultimately elevate their brand to current and prospective members. Using Omnipress as a single-source solution provided immediate results for the entire organization. Removing all of the time and tasks associated with print and fulfillment has helped them re-allocate resources toward higher value initiatives such as building awareness of their programs while increasing attendance. Additionally, they are now providing materials to learners that better reflect the true quality of their programs.